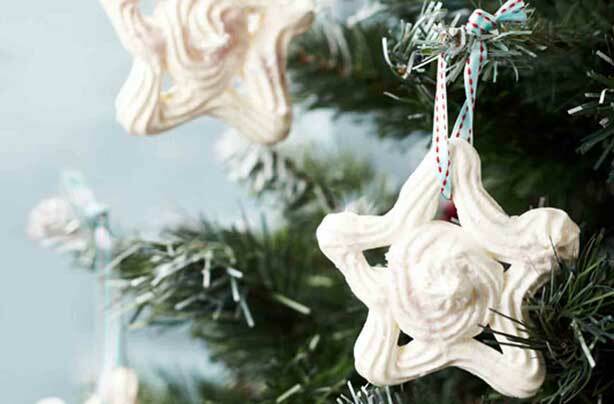 Make your meringues into cute star shapes to turn them into festive decorations – will you be able to resist eating them off your tree? Set the oven to 110°C/225°F/Gas Mark ¼. Draw round the star-shaped cutters on the Bakewell paper to create a template. Whisk the egg whites in a large mixing bowl until they’re firm. Add half the sugar and whisk well until the meringue is stiff and glossy. Quickly whisk in the rest of the sugar. Put the meringue into the piping bag and pipe stars on the Bakewell paper. Sprinkle with glitter. Bake for 1-1¼ hours until they’re crisp and come off the paper easily. Turn off the oven and leave the stars in there for a couple of hours to dry out well. Thread ribbon through stars to hang them on the Christmas tree. They should keep for 2 weeks.